In the last few years, technological advances have been changing the transportation system in ways unanticipated and unprecedented. Bike-share and car-share offered alternatives heretofore nonexistent. Then, in swept Uber and Lyft and other “Transportation Network Companies,” or TNCs, and mobile apps that could completely change the ways people move around in their communities. The National Academies of Sciences, Engineering, and Medicine convened a Committee for Review of Innovative Urban Mobility Services to conduct a consensus study on “technology-enabled transportation services,” including car-share, bike-share, TNCs, ride-sharing companies and mobile apps. 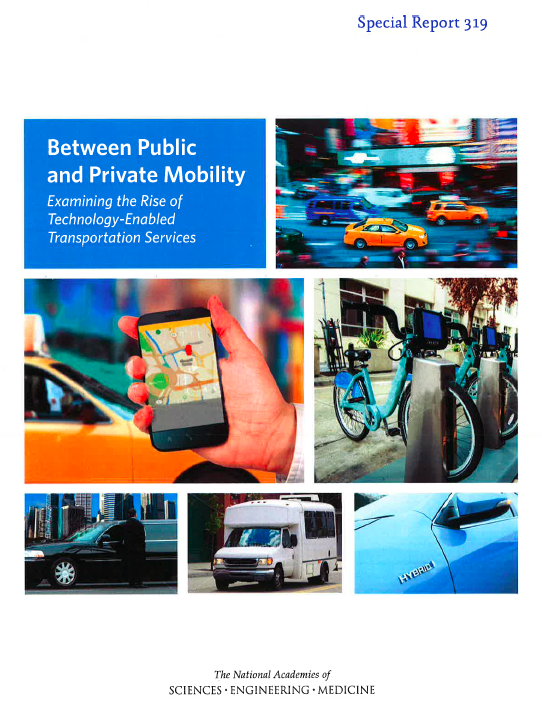 Its just-released report, “Between Public and Private Mobility: Examining the Rise of Technology-Enabled Transportation Services,” raises open-ended questions about how these new services might affect current and future transportation systems, and what policymakers and planners ought to be thinking about.